restructuring the form of the nose through open surgery or injected fillers to help relieve breathing problems and improve the aesthetics of the face. addressing structural issues (like a deviated septum or enlarged turbinates) to improve breathing. 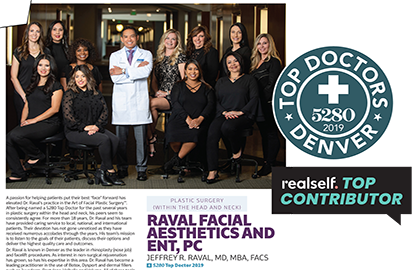 Removing lax skin, repositioning excess fat, and redefining the volume or contours of the face through one of Dr. Raval’s traditional, mini-, or combo-lift procedures. resituating and trimming skin and fat to rejuvenate the eyes and tissues and remove signs of age and fatigue. balancing disproportionate facial structures with fillers and implants to correct trauma, congenital deficiency, and bone desorption. repositioning the brows through minimally-invasive incisions to reduce bagginess, puffiness and wrinkles while dramatically improving the youthful appearance of the forehead. enhancing lips by the injection of a biodegradable gel to enhance the face with fuller and more youthful features. restoring smoothness and volume to skin by injecting the “next-generation” dermal filler to remove wrinkles, folds, and smile lines.